"My mother was disturbed, so maybe none of this is true." While made-for-television movies have nearly as bad a reputation as direct-to-video ones, every now and then there's a reasonably good release that ends up being rather surprising in its effectiveness. This picture from writer/producer/director Richard Jefferies offers some good suspense and reasonably competent CG effects for a low-budget independent release. Half-crazed Frank Sears (Johnathan Schaech) shows up at the about-to-be-demolished Fort Lambert warning of some kind of terrible danger lying below it in sublevel 3, in vault 12—so horrible that it caused his mother to not only carve reminders of these facts in his hands as a boy before committing suicide. 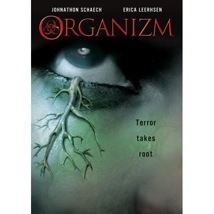 Of course, military hazmat technician Carrie Freeborn (Erica Leerhsen) and husband Glenn (Jason Wiles) is ordered to go check it out and despite Frank's warnings, disturbs a Cold War bioweapon that suddenly lurches into uncontrollable growth. Before long the organism has spread throughout the fort and begins to reach out to the surrounding area of New Mexico, and it becomes clear that the thing feeds on light and energy, making the army's attempts to drive it back only cause it to grow larger and faster. Frank and Carrie must somehow find a way to destroy the thing before the sun comes up and causes an end to life on earth—if the Army doesn't cause that by hitting it with a nuclear strike first. There are several things going for this production, not least of which is Jefferies firm grasp on suspense pacing and keeping things moving at a good clip. With elements of The Andromeda Strain and The Blob working at once, this feels like a Cold War sci-fi plot in some respects, with a modern feeling. Even the military's reactions seem as if they're solidly placed in the 1950s, which given the thematic material is appropriate if not entirely naturalistic. Of course, the excuses of red tape and chain of command can keep such reactions credible in either milieu. The script offers some nice moments of irony as well, with Frank's warnings serving to trigger disaster in and of themselves, with the law of unintended consequences having free rein. At the same time, there are some nasty Freudian undertones to the drama that give it a personal resonance when it seems as if it ought to be highly impersonal. On the other hand, there are some moments that fall with a clunk. Carrie's reactions after her husband is devoured by the organism don't ring true at all. There's one highly risible sequence in which Carrie exhorts Frank to fight infection by the thing after exposure to it, despite there being no indication to that point that it can be fought at all. There's also a teaser at the beginning that might work to hold a viewer's attention when this aired on the Sci-Fi Channel, but which just feels repetitive when it's seen as a stand-alone feature. The economics of computer-generated effects are clearly getting to be quite reasonable, since there are a ton of such effects in the picture, and the believability of the growth of the organism is critical to the film working. Some of that material is a little spotty, but since the deadly creature is supposed to be something extraordinary as well as wholly alien, it looks good enough to satisfy, especially considering how much its ever-growing tendrils are visible onscreen. While the cast doesn't offer any big names, the leads are reasonably competent. Character actor James McDaniel is a standout as Carrie's commanding officer, who refuses to be deterred from his mission regardless of the consequences. While it could be wholly one-dimensional, he also injects some solid humanity into the part under the all-business veneer. Schaech has an interesting if unlikely evolution from a barely functional nebbish to an action hero determined to save the world, but under the circumstances, and once we learn the backstory of the organism, it works well enough. At least there aren't any forced romances clogging up the plot. Image Transfer Review: Part of what makes this seem more than a run-of-the-mill television production is the use of a 'scope frame that gives it a bigger reality. The transfer is solid, with no significant edge enhancement. There's pretty good grain structure though there seem to be moments that have had some digital noise reduction. That may be intentional, however, since there seems to be plenty of manipulation for effect going on here. Texture and detail generally are reasonably good, though shadow detail is somewhat plugged up. Audio Transfer Review: Both stereo and 5.1 English tracks are provided. There are some scenes that offer surround activity, though it tends to be fairly front-oriented overall. Dialogue is clean throughout, and there's no hint of noise or hiss. It's not particularly remarkable, but certainly serviceable. Extras Review: Other than an anamorphic widescreen trailer (which is odd since this never seems to have had a theatrical release), the only extra is a commentary from the principals. It's quite chatty, without any dead spots, but it tends to be rather bland and given to narration. The high points involve Jefferies questioning the cast about their approaches to the characters and details about the prison that doubled for Fort Lambert. A surprisingly competent little sci-fi thriller with a 1950s flair, given a nice transfer and a decent commentary in support.